Alg-A-Mic is a vitality booster made from cold pressed concentrated seaweed; hence its extremely high content of trace elements and hormones of vegetable origin. Bio-Bloom is a complete liquid organic fertilizer. Bio-Grow is a liquid organic fertiliser that can be used in all types of soil mixtures during the vegetative stage. Fish-Mix is an outstanding fertiliser in the field of organic growing. Smelling very strongly of fish it is often used in outdoor cultivation. RootJuice is a 100% vegetable root stimulator. TopMax is a 100% organic bloom stimulant comprised of the pure essence of special flowers. 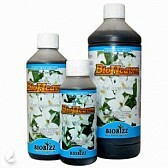 Bio Bizz BioHeaven is a specially formulated Plant Energy booster containing carefully selected biological stimulants.